Protein is one of three essential macronutrients alongside lipids (fats) and carbohydrates. Having a balanced diet that includes all three macronutrients is pivotal for good health. Protein is a macromolecule, or a large molecule. It is called a macronutrient because it is a physically larger type of nutrient our body requires in order to sustain life and promote good health. 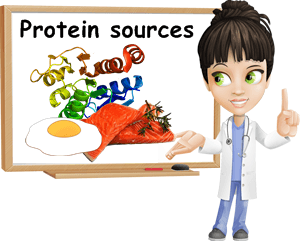 Proteins are made up of chains of organic compounds called amino acids. Proteins serve the most diverse of functions, from bone matrix formation to muscle formation and repair. They take part in cell signaling processes, help carry out enzymatic reactions and bind molecules, a role with deep implications in immunity and neurotransmission, or neuron communication. For these reasons, and many more, including protein-rich foods in our daily diet is crucial for keeping alive and healthy. Experts currently recommend that about 20 to 35% of our daily calorie intake should consist of protein, if not more. Recommendations may vary widely from person to person, depending on individual requirements. As a macronutrient of extreme nutritional importance, protein serves a bewildering range of functions within our body, most of which are essential for our survival. To put it simply, proteins are responsible for ensuring structure and support in our body. The difference between protein sources. According to top research, the best protein food sources are animal sources. This has lead to animal protein being called complete protein, first-class protein or superior protein. Plant protein from vegetables, nuts, grains, seeds ranks second. But why is animal protein better than plant protein? As mentioned above, proteins are made up of amino acids and amino acids are classified into essential and non-essential. Essential amino acids are a type our body cannot produce itself but requires in order to keep us alive. As a result, we have to get them from our diet (protein food sources). Non-essential amino acid are a type our body can synthesize itself so we don’t have to worry about getting them from food. Animal sources such as eggs contain all the essential amino acids we need, which is why they are called complete protein. Plant sources may contain several or most of them, but not all so having a mainly plant-based diet may engender side effects for this very reason. Of course, there are alternative solutions such as amino acid supplements or a rigorously kept plant-based diet, rich in high-protein legumes, nuts, seeds and grains. In the end, we have to listen to our body and eat what makes us feel good, whether it’s animal or plant protein or both. 1) Eggs. One and a half, medium-sized hard boiled egg (100 g) contains about 12.6 g of the highest quality protein called complete protein. Unlike most foods, eggs contain all the essential amino acids our body requires for keeping alive and healthy, plus several non-essential, yet important amino acids. Even more, eggs contain moderate amounts of fat which help with the absorption of fat-soluble vitamins such as vitamins A, D, E and K.
However, it might be best to avoid consuming raw eggs because the uncooked egg white contains avidin, a protein that binds to biotin and prevents its absorption at the intestinal level. Cooking the eggs destroys the biotin-binding properties of the protein. 2) Whey. When making cheese, milk is curdled by adding an acidic compound such as vinegar or curd and then strained, resulting in soft, yet solid pieces of cheese and a leftover whitish, milk-like liquid called whey. This leftover liquid is rich in special whey proteins and represents a wonderful and healthy natural source of quality proteins. 3) Whey protein. Round proteins called globular proteins are extracted from whey, resulting in whey protein. Whey protein is marketed either as a drink or a protein powder and particularly appreciated by bodybuilders who wish to increase their muscle mass naturally. 4) Dairy products. Hard cheeses such as goat cheese, sheep cheese or cow cheese, cottage cheese as well as plain Greek yogurt are all great protein sources. While there is no limit to plain yogurt, cheeses have quite a lot of fat and sodium (hard cheese varieties in particular). You can opt for low-fat, low-sodium dairy products, but also up your intake of potassium-rich foods to balance our any excess sodium and prevent water retention and hypertension as well as keep to a moderate consumption. 5) Milk. Despite the fact that not everyone can digest milk and milk products properly, milk remains a good protein-rich food. Look for milk from grazing cows, goats and sheep and keep to a moderate intake. Aside from important proteins such as cassein and whey proteins, milk also contains good amounts of fat to help with the absorption of fat-soluble vitamins (A, D, E and K). 6) Meat. From a nutritional point of view, several types of meat are extremely rich in proteins. Lean beef and pork meat and chicken and turkey meat are excellent sources. It is important that the meat comes from grass-fed animals and consumption remain moderate. Meat is not only a good source of protein, but also one of the few natural sources of vitamin B12, a nutrient of great importance for brain function and blood formation. 7) Fish. The healthiest fish sources, richest in protein and essential nutrients such as vitamin B12 and Omega-3 fatty acids are salmon, tuna, sardines, halibut and their canned versions. Fish can be a great meat substitute not only because of its generous quality protein content, but also because it promotes good brain function, helps lower LDL (bad) cholesterol levels by increasing HDL (good) cholesterol levels and encourages the absorption of critical fat-soluble vitamins. 8) Legumes are one of the best source of plant protein, ideal for vegans and vegetarians and anyone in between. Dried lentils (26 g of protein/100 g), peanuts (25 g), mung beans (23 g), white or navy beans (22 g), black beans (8.8 g), kidney beans (7.2 g), cooked chickpeas (8.8 g), green beans (1.8 g) are all great options. The best part is they also contain generous amounts of dietary fiber to help regulate intestinal transit and improve healthy gut flora populations. 9) Nuts and seeds. Almonds (21.22 g of protein/100 g), cashews (18.22 g), macadamia nuts (7.9 g), pecans (9.1 g), mongongo nuts (24 g), pine nuts (13.7 g), pistachios (20.2 g), walnuts (15.2 g), Brazil nuts (14.3 g), flaxseeds (18.29 g), dried sesame seeds (17.7 g) etc. all boast a generous protein content, even considering that we can only consume limited amounts. Despite being high in calories, nuts and seeds are rich in dietary fiber, vitamins and dietary minerals and thus promote good health in many ways than one. Walnuts even contain healthy Omega-3 fatty acids, ideal for brain health. 10) Grains. Best protein sources include oats (16.9 g of protein/ 100 g), spelt (14.57 g), amaranth (13.56 g), buckwheat (13.25 g), quinoa (4.4 g), millet (11 g), sorghum (10.6 g), barley (9.9 g), wheat (12.6 g). Moderate consumption is beneficial particularly for people with a plant-based diet who wish to improve their protein intake and enjoy varied options. Conclusions. So which is better: animal or plant protein? From a nutritional point of view, animal protein is better than plant protein, provided it is consumed in moderate amounts, yet bad from an ethical point of view because we would be eating live, sentient beings when there is a pretty good alternative in the form of plant sources. In the end, this is a decision each an every one of us has to make for themselves, based on good judgement and a good understanding of our nutritional requirements.